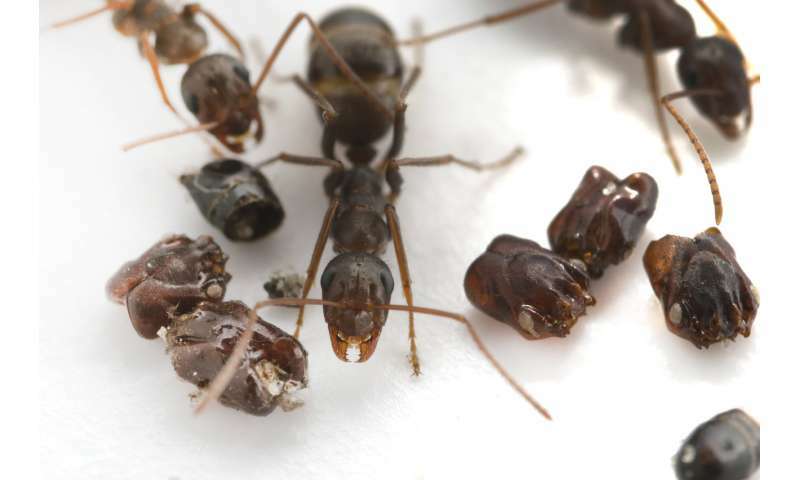 "Add 'skull-collecting ant' to the list of strange creatures in Florida," says Adrian Smith a scientist at the North Carolina Museum of Natural Sciences and North Carolina State University. His new research describes the behavioral and chemical strategies of a Florida ant, Formica archboldi, that decorates its nest with the dismembered body parts of other ant species. "In 1958, shortly after this ant was described as a species, scientists reported something weird about it," says Smith, the author of this study. Its nests were home to a collection of decapitated heads of trap-jaw ants. Trap-jaw ants are known as fierce insect predators, not easy prey for other ants. Since then, researchers have speculated that F. archboldi either inherits old trap-jaw ant nesting sites or is somehow a specialized predator. However, scientists had yet to study the biology of this ant in detail. "This was a study that grew out of reading a peculiar observation in a 60-year-old research paper," says Smith. "Odds were that these ant heads weren't in Formica nests by chance and that there was some interesting biology behind this natural history note." In researching this entomological oddity, Smith was surprised to find that F. archboldi chemically mimic their trap-jaw ant prey and use what is normally a chemical defense, a spray of formic acid, as a deadly weapon against trap-jaw ants. Using high-speed video recordings Smith found that F. archboldi attacks involve a targeted spray of formic acid that quickly leads to an immobilized trap-jaw ant. Time-lapse video observation of the interior nest chambers of laboratory colonies found that freshly-killed trap-jaw ants are dragged into the nest like food items and dismembered. Leading to nests filled with trap-jaw ant body parts, as is found in natural colonies. "The scientifically surprising finding of this study was that these ants chemically match or mimic the chemical profiles of two species of trap-jaw ant," says Smith. The ants match in their cuticular hydrocarbons, a complex layer of waxes that coat the outer surface of an ant. Ants typically use these compounds as nestmate and species-specific signals. "It's really unusual for an ant species to display this much variation in chemical signature. Also, chemical mimicry is usually a tactic used by social parasites, but there's no evidence that F. archboldi are a parasitic species." "In aiming to figure out one unusual aspect of this ant's biology, this research has turned up another in the chemical data," says Smith. Though this study was unable to find a direct link between chemical mimicry and predatory behavior, this chemical mimicry likely hints at a long evolutionary history between these ant species. "Now Formica archboldi is the most chemically diverse ant species we know of. Before this work, it was just a species with a weird head-collecting habit. Now we have what might be a model species for understanding the evolution of chemical diversification and mimicry", says Smith. The paper, "Prey specialization and chemical mimicry between Formica archboldi and Odontomachus ants," is published in the journal Insectes Sociaux.